This rotating poster exhibit highlights and educates students about prominent Americans of color who have made significant contributions to the fields of science, technology, engineering and mathematics. The exhibit celebrates diversity in STEM, represents the underrepresented and provides role models for all students. After their child endured several race-related incidents at school, two Brackett parents decided that the best way to confront the hurt and shock these incidents created was to channel their energy into something positive. Ultimately, they created The Colors of STEM project in order to open students’ eyes to the broad impact that American people of color have had in STEM fields. 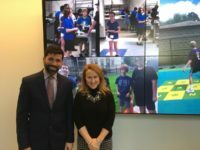 Furthermore, the project goals include teaching tolerance at an early age by connecting with elementary school-aged students. The co-creators of The Colors of STEM knew their message would be relevant beyond Brackett School so they approached AEF in order to reach a wider audience within the Arlington Public Schools. It is rare for parents to apply for AEF grants so the AEF Board was particularly excited to receive this grant and to guide the applicants through the process. The grant was appealing to AEF because the goals of the project are well-aligned with the Arlington Public Schools’ Safe and Supportive School initiative, and AEF strongly supported broadening the grant to reach beyond Brackett school. Eventually, the poster exhibit will be shared with other schools in the district. Thus far, two of the posters have been created and put on display at Brackett School. The posters are on a wall opposite the library so every student has the opportunity to see, and perhaps stop and study, the posters as they visit the library. Thanks to the Friends of the Brackett Library, new books about the individuals on the posters are available for students to check out as well. The first poster highlights Neil deGrasse Tyson, an astrophysicist and the director of the Hayden Planetarium in New York City. Tyson is half Puerto Rican and half African-American. The second poster portrays Steve Chen a Taiwanese-American computer scientist who is one of the co-founders of YouTube. The next poster will feature Katherine Johnson, an African-American mathematician who worked for NASA. Each of the posters is specifically designed to be very engaging and accessible to the elementary students. Once the exhibit is complete, The Colors of STEM will have the opportunity to breed tolerance and inspire students across the school district.